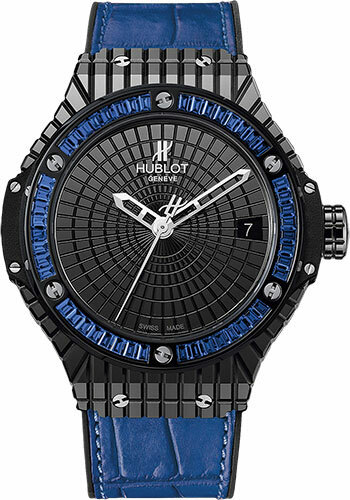 41mm polished black ceramic case, black PVD 18K white gold bezel set with 48 baguette blue sapphires, black composite resin lateral inserts and bezel lugs, polished black ceramic dial with polished rhodium plated hands, self winding HUB 1112 movement, approximately 42 hours of power reserve, black rubber and blue alligator strap with black PVD stainless steel deployant buckle. Water resistant to 100 meters. 41mm polished black ceramic case, black PVD 18K white gold bezel set with 48 baguette amethyste, black composite resin lateral inserts and bezel lugs, polished black ceramic dial with polished rhodium plated hands, self winding HUB 1112 movement, approximately 42 hours of power reserve, black rubber and purple alligator strap with black PVD stainless steel deployant buckle. Water resistant to 100 meters. 41mm polished black ceramic case, black PVD 18K white gold bezel set with 48 red spinelle baguettes, black composite resin lateral inserts and bezel lugs, polished black ceramic dial with polished rhodium plated hands, self winding HUB 1112 movement, approximately 42 hours of power reserve, black rubber and red alligator strap with black PVD stainless steel deployant buckle. Water resistant to 100 meters. 41mm polished black ceramic case, black PVD 18K white gold bezel set with 48 baguette citrinnes, black composite resin lateral inserts and bezel lugs, polished black ceramic dial with polished rhodium plated hands, self winding HUB 1112 movement, approximately 42 hours of power reserve, black rubber and yellow alligator strap with black PVD stainless steel deployant buckle. Water resistant to 100 meters. 41mm polished black ceramic case, black PVD 18K white gold bezel set with 48 baguette tsavorites, black composite resin lateral inserts and bezel lugs, polished black ceramic dial with polished rhodium plated hands, self winding HUB 1112 movement, approximately 42 hours of power reserve, black rubber and green alligator strap with black PVD stainless steel deployant buckle. Water resistant to 100 meters.